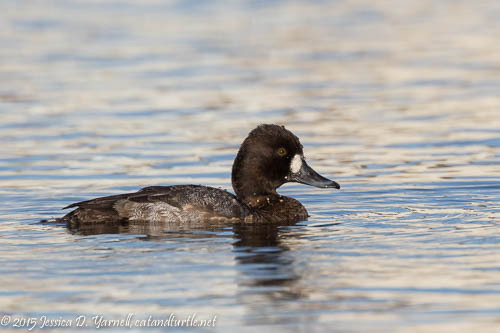 We’ve had a small flock of Lesser Scaups in a retention pond near our house. One afternoon I took a walk with my Beast to see if I could photograph them. I had a feeling they’d be pretty skittish, but they didn’t seem to mind me. I did get some funny looks from the golfers, though! 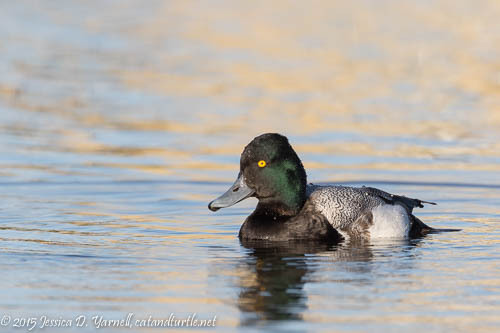 Lesser Scaups are pretty common winter ducks. I haven’t had a whole lot of opportunities to photograph them, though, so I was pleased to get them in pretty afternoon light. Look at how the male’s black head glistens dark green in the bright sunlight! The female is brown with a white spot on her face.